The oldest classic of them all, La Doyenne was first run in 1895, and is often described as the hardest single day race on the calendar. Such a statement is hard to quantify but, just like the Tour of Flanders, the winner in Liège is rarely undeserving. This is a race for hard men, not the hard men of the Northern cobbled classics, but more for a rider who can climb and also possesses a lot of strength and endurance. It should come as no surprise that the rider with the record of most wins in this race is Eddy Merckx with five victories, for he had these qualities in abundance. The roll call of winners reads like a who's who of cycle racing. Anquetil, Kelly, Hinault, the aforementioned Merckx, Van Looy, de Vlaeminck and Argentin have all left their mark on this race. The race is also one of the few places where the classics specialists and the tour riders race against one another. Any rider preparing for the Giro must be beginning to find his best form four weeks before the start of the Giro so Liège is a good place to test one's form. In recent years Abraham Olano, Evgeni Berzin and Stephen Roche have all showed well in Liège before going on to do well in the Giro. In 1994, for example, Berzin won both whilst in 1987 Roche should have won both but the cat and mouse tactics that he and Criquielion indulged in allowed Argentin to sneak up from behind and surprise them both to win. The characterising feature of the race is the hills of the Ardennes region that litter the route on the journey back from Bastogne. These climbs are short, no more than 3 or 4 kilometres in length, and very, very steep, with gradients as steep as 25 per cent in places. The roads are usually little more than a couple of metres wide meaning that a good position is vital before the climb starts. A strong team is, therefore, usually an advantage in gaining ideal position. There are usually around 10-12 of these climbs littering the route from Bastogne back to Liège but it is the 90 kilometres from the Stockeu 'Wall' to the finish that are the key to success. The defining climb of the race is La Redoute - a two kilometre lung burster with a gradient of 25%at the top which is reached with around 30-35 kms (depending on the route) to the finish. After the climb there is a kilometre of false flat and the winning move is often formed here. In 1998, for example, Michele Bartoli dragged 5 other riders, Jalabert, Boogerd, Massi, Vandenbroucke and Dufaux, clear here and the rest of the peloton didn't see them again until after the finish. For me, the finest man of the Ardennes in the post-Merckx era is the Italian Moreno Argentin who won four times between 1985 and 1991. Argentin was the archetypal L-B-L rider, a man who combined brute strength with superb climbing skills. His victory in 1991 was one of the great duels of recent years. Argentin had won the Flèche Wallone just 4 days before in a display of strength and power that has rarely been seen since the Coppi era. He had attacked alone some 80 kilometres from the finish and soloed in to win by over 4 minutes. His great rival, local hero Claude Criquiellion, had led the chase that day and, in his final appearance in the race, was seeking revenge in L-B-L. The two riders were active on the front on the early climbs and seemingly took it in turns to try and drop the other all the way to the finish. Only Argentin's Ariostea team-mate and up and coming Spaniard Miguel Indurain could stay with them and at the finish in Liège, Argentin completed the Ardennes double by outsprinting Criquiellion. Throughout this decade the simple pre-requisite for victory is to ride for an Italian team. 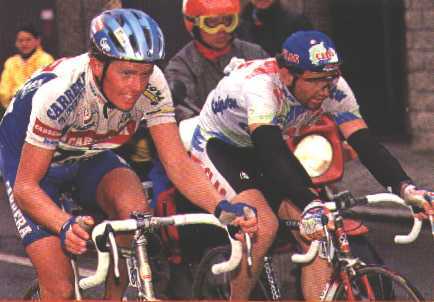 Since Van Lancker won in 1990 for Panasonic the remaining races have all been won by riders on Italian teams. Another interesting fact is the fact that of all these wins the largest group to contest the finish was in 1991 when there were four riders. Richard's win in 1996 involved a group of three (Richard, Armstrong and Gianetti) but the rest of the races have been won by a rider finishing alone. This tells us something about the difficulty of the race. Of all these wins the most impressive has to be the last two by Michele Bartoli. In 1997 he broke away with the ONCE duo of Jalabert and Z�lle then disposed of them both in the closing kilometres to win alone. In 1998 he forced a break clear on La Redoute then attacked again on the penultimate climb, the C�te de Sart-Tilman, to ride the last thirteen kilometres all alone.